This is a perfect meal to make following London broil, flank steak, skirt steak, or other firm cut of roast to make use of planned leftovers. Combine 2 Tbsp cornstarch, 2 Tbsp water, and garlic powder in a bowl and mix thoroughly. Add cooked London Broil and toss until well coated. Heat 1 Tbsp of oil in a large skillet; add cooked London Broil and stir fry until reheated, about 1 minute. Remove meat from skillet; Heat remaining oil in pan; add broccoli, stir-frying for about 5 minutes. 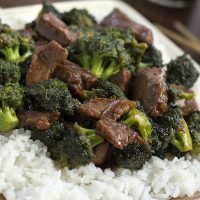 In a small bowl, mix together soy sauce, brown sugar, ginger, and remaining 1 Tbsp of cornstarch and remaining water; add soy mixture and cooked beef to skillet. Cook for 2-5 minutes, stirring frequently. Serve over cooked rice.